While there are a lot of companies that claim they can connect you with your target audience, there is one company that has the numbers to back up this claim. With a 93% client retention rate, .36% average click-through rate which is four-times the industry average, 150% higher brand lift compared to our competitors measured by Nielsen, PK4 Media means business. 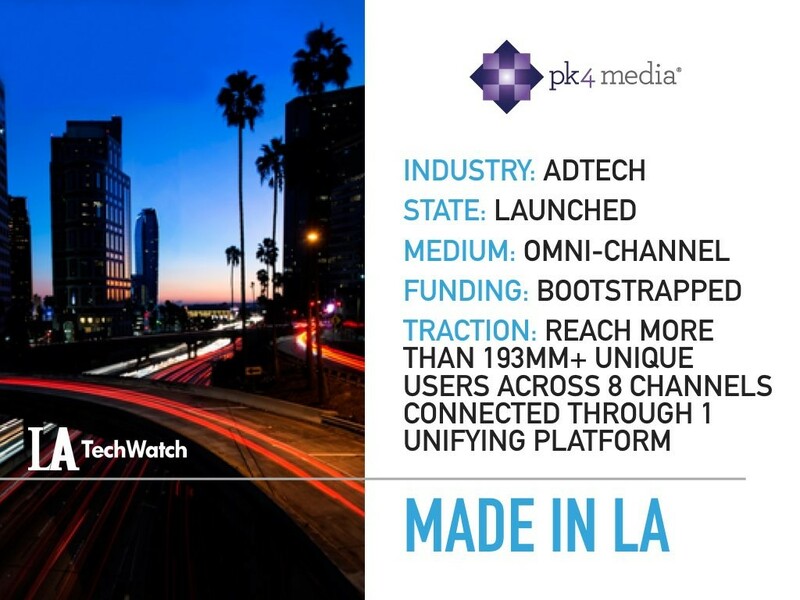 With big name partners such as Lexus, 20th Century Fox and NYU, PK4 Media is living up to the myriad of awards they have received as one of the fastest growing companies in the LA Startup ecosystem. LA TechWatch spoke with founder Tom Alexander about the Startup and how they have gained traction as fast as they did. PK4 Media is the advertising industry’s first Omni-Channel Media Company. Through our proprietary technology we help brands reach their target audience across an unprecedented eight digital channels: Desktop, Mobile, Tablet, CTV, VOD, In-Mall, In-Theater and Digital-Out-Of-Home. We serve, monitor and report on display and video creative across all channels Combining our brand-first technology platform, XPS, with premium direct-to-publisher relationships, PK4 Media provides in-depth site and platform integrations, while managing exclusive engagement KPIs. PK4 Media helps world-class brands expand the reach of their digital advertising campaigns including: Activision, Amazon, Bacardi, Esurance, Ford, Honda, KitchenAid, Lionsgate, Microsoft and Procter & Gamble. PK4 Media recently acquired TruEngage (its third acquisition) and this resulted in the first interactive, branded overlay solution to overcome the “skip this ad” pre-roll problem brands are facing. An eConsultancy study found that 94% of pre–roll ads are skipped. The new solution from allows consumers to skip ads with one click but at the same time engages them with the product in a fun, interactive and memorable way. Here is an interactive example from to experience first-hand. This campaign had success by telling users “TO SKIP AD: HELP THE HOLIDAY POOCH TO THE HONDA!” With one click, users could drag the dog to the Honda and skip the ad. Engagement for this campaign was up nearly 20% as consumers either viewed the ad in its entirety or engaged with the product while skipping. According to Gartner Research, campaigns that integrate four or more digital channels outperform single or dual-channel campaigns by 300%. PK4 Media is the first and only media platform that enables brand campaigns to reach their target audience across eight digital channels. Not only does that expand our clients’ reach for one campaign, but it allows us to gather and share an unprecedented amount of data across all channels to inform future campaigns and maximize ROI like. The performance of our campaigns is transparent and verified by third-parties including MOAT (recently purchased by Oracle), comScore, Nielsen and LiveRamp. We are attacking the digital media industry within advertising. Digital media accounts for approx. $82B+ (emarketer) in spending for 2017. The digital advertising industry cuts across all sectors and geographical locations. We have a wide-range of clients in the tech space, automobile industry, consumer products and so on. We are based on a managed service model, developing brand and campaign strategy, as well as campaign execution. Tell us about the experience of building an adtech company in LA? Adtech has grown quite a bit in LA over the last several years. While Silicon Valley’s influence has reached us in LA, PK4 Media has built our business without Venture investment. Our organic growth is rare in our industry, as well as within LA. As adtech has grown, so has PK4. My background has always been in sales within digital media. Like many entrepreneurs, I noticed the flaws and issues with the various companies within the industry. My goal with PK4 was to ensure brands had that confidence in their partner relationships as the industry keeps evolving. PK4 grew with our clients, developing new channel integrations, and being the only platform that can connect users and data across 8 channels. 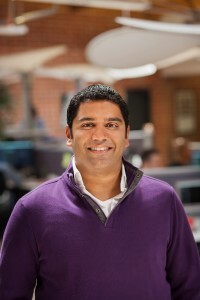 Being in LA has allowed us to recruit some amazing talent, including our VP of Engineering / Product Development. The growth of tech based roles in LA has been incredible, and has contributed to the success PK4 has seen over the years. We plan on building out a new channel within our Omni-Channel platform which we will announce soon. No one specific, we aren’t looking for funding. Being “Made in LA” is a source of pride for my company and me. We have built things here that could not have been built anywhere else. We’ve developed partnerships that have been based in LA that have helped our company grow. 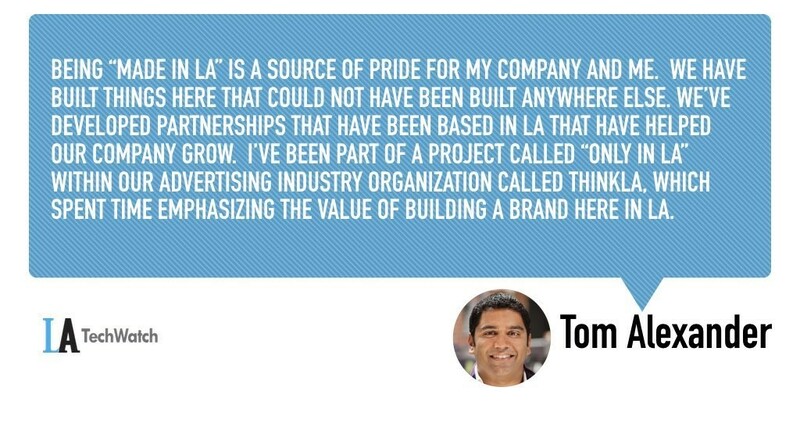 I’ve been part of a project called “Only in LA” within our advertising industry organization called ThinkLA, which spent time emphasizing the value of building a brand here in LA. Presenting more continued education type programs, and focused ways for entrepreneurs to connect with others – even a mentoring program.